Treat-or-treating may just be for the kids, but that doesn't mean adults can't enjoy Halloween their own way. Throw a costume bash, invite a few friends over to relax or just unwind by yourself on this classic October holiday. As part of the festivities, be sure to whip up a tasty seasonal cocktail in your frozen concoction maker. While a pumpkin spice margarita or a candy-themed drink can be the perfect thing on Halloween, the real trick is to make your drink a little extra spooky. Try out these ingredients to enhance that Halloween cocktail to something truly festive. Fake blood is a Halloween staple, but it can also be a tasty addition to your drink. Try adding grenadine to your favorite cocktail by drizzling it on the interior of your glass before you pour the cocktail in. This will give you a red streaky look. You can also add this red syrup on the exterior of your glass, the rim or on the top. Just remember: This fake blood can get messy. Pull out all the stops this Halloween. 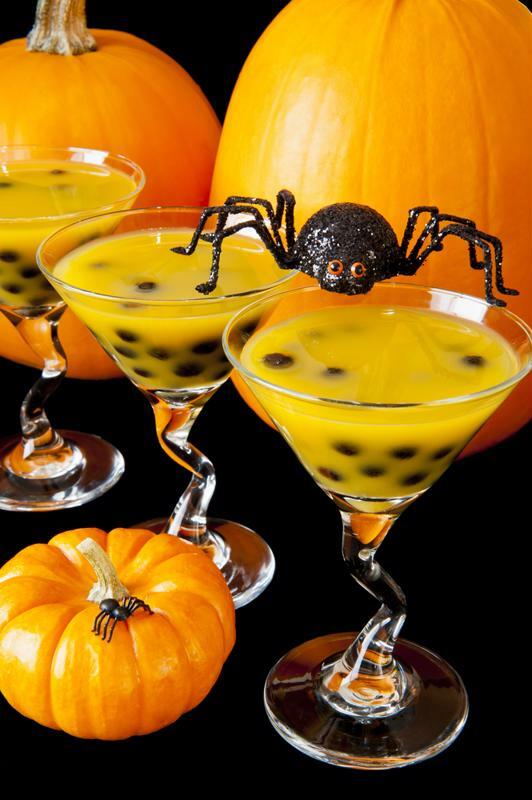 Spruce up any cocktail for Halloween with an "eye ball" or two. Use lychee or skinned grapes to get that eerie looking garnish that's as delicious to eat as it is creepy to see. If you don't want to use fruit, you can radishes, olives and even cocktail onions. Add a blueberry or some food dye for the creepy pupil that makes your drink look back at you. If you want to give your drink a truly midnight, Halloween feel, make it darker. Add a little black vodka to your favorite recipe to concoct a cocktail that's as dark as the night sky. Use bright garnishes to contrast this black cocktail. All pumpkins are orange, but only this one is made from oranges. An orange slice can be used as a faux pumpkin on top of your drink. Use a sprig of mint or a lime rind for its stem. You can also use the orange rind as a pumpkin or Jack-o-latern on the edge of your glass. One of the easiest and most impactful Halloween cocktail decorations is to simply add a toy to the rim. Opt for a fun fake spider or a more complex web. Think of these toys as the Halloween version of a paper umbrella.